Cinderella Builders Her Dream! Puppet Show - Luce Puppet Co.
Download the Cinderella Coloring Page! It’s the fairy tale you know and love, but turned on its head with an all-dog cast and a do-it-yourself twist. 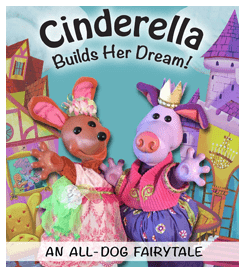 Help Cinderella design and build her own way to her dream come true!